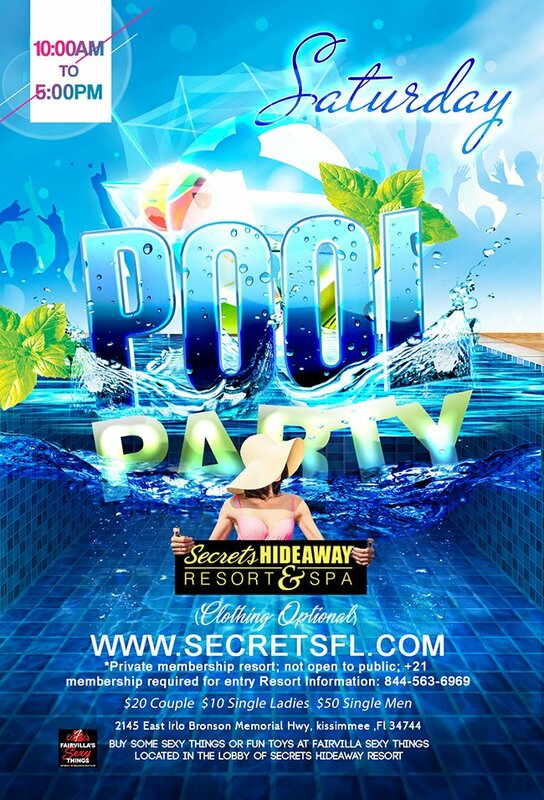 Celebrate Saturday in the sexiest way possible at Secrets Hideaway’s clothing-optional pool party! The weather is hot, so come strip down and cool off poolside. Join all of your sexiest friends at Secrets Hideaway Resort and Spa for a day in the sun, drink in hand, hot music, and even hotter friends. Our courtyard pool area and two outdoor tiki bars are the perfect location to let loose, be free, and celebrate summer! Whether you're in the mood for brunch or pool-party snacks, we’ll keep you fueled while you party away the afternoon, no bikini required! With frozen cocktails, mojitos, margaritas and more, our tiki bar will make you feel like you escaped to the tropics, if only for the day! Reserve your pool-side cabana and lounge in luxury for a full 8 hours of arousing fun. Or sneak off to our playrooms and create your own heat. However you choose to spend your afternoon, your Saturdays are always hotter at Secrets Hideaway Resort & Spa!